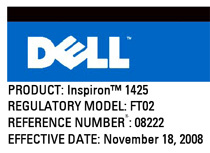 Dell’s Inspiron 1425 leaked: like the 1420, but slimmer? Sure, the base price of Dell’s Inspiron Mini 9 is pretty palatable, but good luck passing through that hard drive selection screen with this option unchecked. Yep, as now, Mini 9 buyers can opt for a capacious 32GB solid state drive (a luxury already available in Japan), which is a $100 upgrade over the standard 4GB SSD. Enticing enough to make you finally pull the trigger?